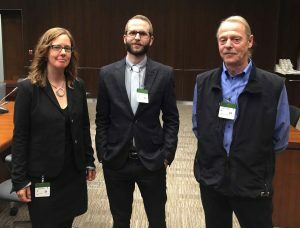 Sierra Club BC traveled to Ottawa this week to present to the Transport Committee about Bill C-48, the Oil Tanker Moratorium Act for BC’s north coast. There is nowhere else on earth like the north coast – and so we commend the government for introducing a legislated tanker ban. The fact that we have reached this point is due to the hard work of our supporters over the years who have spoken up against Enbridge’s Northern Gateway proposal and in defense of the coast – thank you. The Oil Tanker Moratorium Act isn’t perfect, but it’s worth celebrating. Our friends at West Coast Environmental Law did a useful blog that outlines the good and the not-so-good of this Bill. Campaigns Director Caitlyn Vernon traveled to Ottawa to let government know that Sierra Club BC strongly supports the Bill, and that they have broad-based public support for protecting the Great Bear Rainforest from oil spills with a permanent, legislated oil tanker ban. We applaud the government for introducing this Bill. Limiting the Ministerial exemption to emergency circumstances. Including refined oil under the scope of the Bill. Decreasing the tonnage threshold to 3,200 tonnes, which according to a recent Transport Canada report is the maximum needed for community fuel supply. Expanding the geographic scope to prohibit vessels above 3,200 tonnes from transporting crude or refined oil through Hecate Straight, Dixon Entrance and Queen Charlotte Sound. We believe these amendments are necessary because oil spill clean-up is effectively impossible and because BC’s north coast, the Great Bear Rainforest, is a global treasure worth protecting. For more details, check out the written brief that we submitted to the Committee. In October 2016 the Nathan E. Stewart ran aground in Heiltsuk territory. This was an Articulated Tug Barge that transports petroleum products between Washington State and Alaska. Fortunately, the fuel barge was empty. A contaminated beach leaches diesel back into the marine environment in Heiltsuk territory. Photo by Kyle Artelle. Even so, the sinking of the tug spilled over 100,000 litres of diesel, contaminating an important harvesting and cultural site. The response was slow, uncoordinated, and completely ineffectual for the wave and currents. Booms broke and waves crashed over the booms. Fisheries are still closed. The Nathan E. Stewart provides a sobering reminder of the challenges of spill response in remote locations, and that the social, economic and environmental impacts can be very severe, from even a small spill of refined petroleum products. By decreasing the tonnage threshold to 3,200 tonnes, and prohibiting vessels above 3,200 tonnes from transporting crude or refined oil through Hecate Straight, Dixon Entrance and Queen Charlotte Sound (rather than simply limiting vessels from docking at port, as outlined in the Bill as currently written), these amendments would prevent articulated tug barges from traveling the inside passage and putting coastal communities at risk. Bill C-48 prohibits vessels carrying crude oil and persistent oils. However there are currently two refineries undergoing environmental assessment in northern BC that would result in supertankers carrying refined oil. Refined, non-persistent oils are considered acutely toxic to marine organisms, and so we advocate that the scope of Bill C-48 be extended to prohibit transport of refined oils also. What about the south coast? This government has broad-based public support for a tanker ban. However the expectation is that the Bill prohibit all tankers, not just some tankers. This can be done through the amendments outlined above that continue to allow for community fuel supply but prohibit articulated tank barges and tankers carrying refined oil. And while Bill C-48 focuses on the north coast, oil tankers also pose a huge risk to the economy, communities and wildlife on the south coast of BC. And LNG tankers are a safety hazard. True coastal protection would ban oil and gas tankers in both the north and the south. And then instead of investing in spill response, we could support the wild salmon economy and expand renewable energy production that can generate jobs without damaging our climate or putting the coast at risk of spills. “We welcome today’s announcement of improved spill response, but it doesn’t make coastal communities any safer from the risks posed by a 700 per cent increase in tankers carrying diluted bitumen in southern B.C. waters. “The fact is, the only foolproof way to stop oil spills and protect the coast is to keep tankers off the coast. And world-leading or not, nothing in this plan will help in the case of a major tanker spill. 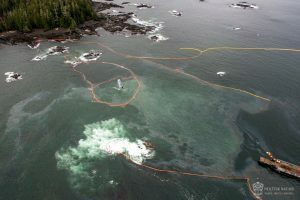 “Recent failed and inadequate spill responses on B.C.’s coast highlight the urgent need for these measures to improve response for existing shipping traffic. “But a bigger, fancier mop doesn’t reduce the chances of a spill. “When it comes to diluted bitumen, a bigger, fancier mop doesn’t really change anything at all: these new measures don’t address the fact that there is no known technology that can clean up sunken bitumen. “Industry considers 10-15 per cent of oil recovered to be a success. If “world-leading” means failing to recover 85 to 90 per cent of the oil, the results would be catastrophic. “The new measures don’t decrease the risk of an oil spill. And they don’t protect the 98,000 coast-dependent jobs that would be put at risk by a spill. “What we need is effective spill response, and for diluted bitumen that simply isn’t possible. “The only real way to protect B.C. coastal communities from a massive oil spill is prevention. The recent sinking of the Nathan E. Stewart tug near Bella Bella in the Great Bear Rainforest has underscored the urgency of a permanent, legislated oil tanker ban. Accidents happen and this disaster is a sobering reminder that oil spills are impossible to clean up. Response crews took over 20 hours to arrive and the spill has still not been contained three weeks later. Beaches remain soaked with diesel and littered with debris. Clean-up efforts have been sluggish and greatly hampered by storms, which have caused containment booms to fail. Members of the Heiltsuk Nation have consistently described the spill response as “totally inadequate.” Their nation’s waters have been polluted with hundreds of thousands of litres of diesel fuel. Their clam and seafood beds are closed indefinitely, costing them tens of thousands of dollars in the short-term as well as long-term damage to their economy. Video updates and ways to support can be found on the Heiltsuk Tribal Council’s Facebook page. A contaminated beach leaches diesel back into the marine environment. Photo by Kyle Artelle. Although many may see this as a relatively small spill, it has already and will continue to have a disproportionate impact on the Heiltsuk. Sierra Club BC and many other organizations stand in solidarity with the Heiltsuk Nation, who are now caught between a provincial and a federal government too busy blaming each other to make any concrete policy changes that could prevent another devastating spill. This is a heartbreaking nightmare. Trudeau needs to wake up and take his election commitments for a tanker ban and for a renewed relationship with Indigenous peoples seriously. The Heiltsuk Nation are calling for an immediate implementation of a full and complete tanker ban. A strong tanker ban is the only sure way to protect B.C.’s coastal waters and wild salmon economy from a devastating oil spill. The federal government is about to make an announcement on a federal tanker moratorium, and we need to ensure it is strong, permanent, and legislated by Parliament. That’s why we’ve set up an action centre where you can submit a letter to Prime Minister Trudeau and Minister Garneau. Please send a message calling on them to implement a strong tanker ban on B.C.’s coast. Coastal First Nations already have a ban on oil tankers, using their own laws. It’s about time we joined them to help put an end to Enbridge’s Northern Gateway pipeline and tankers project. Please donate to help us continue this fight. Cover image of diesel-soaked beach by Kyle Artelle. Vancouver, B.C. – Controversy continues to swirl around the Federal Government’s slow and inadequate response to the significant amounts of diesel oil that continue to seep out of the sunken tug, Nathan E. Stewart in BC’s Great Bear Rainforest. On Vancouver’s Breakfast Television, Prime Minister Trudeau dodged questions regarding his campaign promise to ban oil tanker traffic in the world-famous region, and instead blamed the previous government for the disaster for years of “under-investment”. Late last week the Nathan E Stewart ran aground in Heiltsuk First Nation traditional territorial waters releasing huge amounts of diesel oil into the water forcing an emergency closure of the Heiltsuk Nation’s seafood beds. Members of the Heiltsuk Nation, who observed and reported the spill response as it occurred, clearly and consistently described it as “totally inadequate”. Their nation’s waters have been polluted with diesel fuel and their clam and seafood beds are closed indefinitely, costing them tens of thousands of dollars in the short-term and long-term damage to their economy that will be difficult to revitalize. The Heiltsuk Nation are calling for an immediate implementation of a full and complete tanker ban that the Prime Minister campaigned on in 2015. 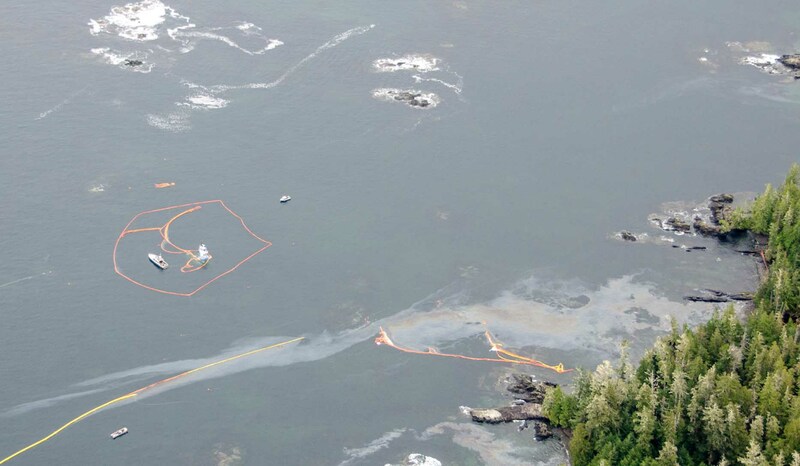 Spill response on the BC coast is privatized and carried out by Western Canada Marine Response Corporation. The company is 51%-owned by Kinder Morgan, who has come under fire for their lack of clarity and detail in the spill response plans submitted with their pipeline and tanker project application that, if approved, would lead to a 700% increase in tankers transiting through Vancouver’s Burrard Inlet and the Salish Sea. Environmental organizations like Stand, the Wilderness Committee, Sierra Club BC, West Coast Environmental Law, Greenpeace, the Georgia Strait Alliance, Force of Nature, North Shore NOPE and civil society organizations like Lead Now and SumofUs support the Heiltsuk call for a tanker ban, while noting that effective fossil fuel spill clean-up technology does not yet exist. While the impacts of the diesel oil spill have been considerable for the marine environment, there are also major social and economic costs to the Heiltsuk Nation. “Our heart goes out to the Heiltsuk who have lost their winter harvest in this spill. No community should ever have to go through this. Botched responses, poisoned waters and ruined livelihoods are becoming far too familiar,” said Peter McCartney from the Wilderness Committee. A strong tanker ban is the only sure way to protect British Columbia’s coastal waters from a devastating oil spill. VANCOUVER—Groups are commending the federal government’s commitment to protect the north coast of British Columbia from oil spills with a tanker ban, and calling on the government to make it a permanent, legislated oil tanker ban. On the 27th anniversary of the Exxon Valdez oil spill that devastated the community of Cordova, Alaska and left Prince William Sound with an oily legacy that persists to this day, Sierra Club BC and Living Oceans Society say that a legislated oil tanker ban is the only certain way to protect B.C.’s north coast from a similar fate. The U.S. National Academy of Science published a comprehensive study of the fate and behaviour of spilled diluted bitumen (dilbit) last December, citing evidence from the notorious Kalamazoo and Mayflower dilbit spills. The multi-disciplinary panel of experts concluded that conventional spill response technology and plans are unable to effectively deal with dilbit. It is more dense and sticky than conventional oil and so defies most kinds of spill response equipment. Also, in fresh or salt water it can submerge or sink to the bottom, making it impossible to find. Not only did the Exxon Valdez oil spill cause immediate devastation—the loss of whales, otters, fish and seabirds— it continues to pollute. The oil that couldn’t be removed from shorelines still persists, and is still toxic, an ongoing source of contamination implicated in the failure of Prince William Sound herring stocks to recover and the slow recovery of other impacted species. Long term genetic damage from exposure to the polycyclic aromatic hydrocarbons in crude oil may mean that some species never fully recover. “Right now there are herring spawning along B.C.’s coast, providing food and livelihood to coastal communities. The loss of a fishery for even a few years can devastate a local economy and strike at the heart of coastal cultures,” said Vernon. Stopping crude oil tanker traffic on the north coast will put an end to Enbridge’s Northern Gateway pipeline for once and for all. This move is undoubtedly due to the years of effort, strength and determination of so many – up and down the coast, across the north, and across the province. We are closer to victory than we’ve ever been but we are not quite there yet. It is important to consider exactly how the federal government will formalize the ban. Environmental groups, First Nations and coastal communities are united in the believing that the ban has to be a permanent, legislated one. It’s the surest way to provide clear and lasting protection from the threat of catastrophic oil spills for this spectacular, abundant part of the world. Let Prime Minister Justin Trudeau know that you appreciate his commitment to protecting this coast and that a permanent, legislated ban is what’s needed and what British Columbians expect from his government. Prime Minister Trudeau also instructed cabinet ministers to overhaul Canada’s broken and discredited environmental assessment process. This is on top of his campaign promise to reassess Kinder Morgan’s pipeline and tankers proposal. Both are welcome moves. A credible process needs to incorporate meaningful public participation; it needs to respect indigenous rights and it needs to consider every proposal’s greenhouse gas emissions. Building a ‘climate test’ into how we make decisions about energy infrastructure proposals will ensure we only approve projects that do not make climate change worse. putting the Kinder Morgan pipeline review on hold until an overhauled federal review process considers climate impacts. It’s time for a new approach to pipelines in Canada that takes our coast and climate change seriously. Because it’s 2015.